Jang uh gui is a great Korean seafood dish using fresh water eel as the main ingredient. This dish can be prepared in various ways in which can be broiled and/or grilled to achieve its distinctive tastes & flavors. Some may choose to do both, first broiling the eel then grilling it to achieve the ultimate perfection in texture and color. To prepare the dish, bones are removed from the eel then marinated with a sweet and tangy sauce which includes rice wine, gochugaru (red chili pepper flakes), sesame oil, soy sauce garlic, sugar and ginger. When cooking, additional sauce may be consistently brushed onto the fish to add extra flavors & aroma. This meal is rich in protein, calcium, vitamin A and E and enjoyed especially during the hot summers to avoid heat exhaustion. It is also believed to be good for stamina. Fact: Eel have high content in protein and fat so it can take a long time to fully digest this fish. Mix all ingredients other than the fish into a saucepan and cook. Once the sauce thickens, set aside and let it cool, ready to be brushed onto the eel. Place eel on chopping board and remove the head. Insert knife through the belly side of the eel and open its abdomen and spread wide. Remove tail along with intestines and bones. Freshly rinse eel in cold water to remove any leftover particles. Vertically cut large eel into 3-4 pieces and small eel to 2 pieces. Insert skewers vertically into the eel to prevent it from curling while cooking. 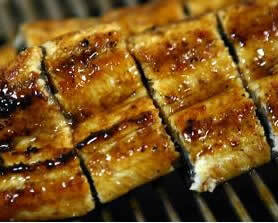 Once preparation of the eel is complete, apply sauce to marinate. Broil 15-20 minutes until fish is fully cooked. Brush additional sauce while broiling if desired. Follow steps 1-8 from directions above. For grilling, marinate fish for 1 hour. Place eel on a grill until fish is cooked. Brush additional sauce while grilling if desired.